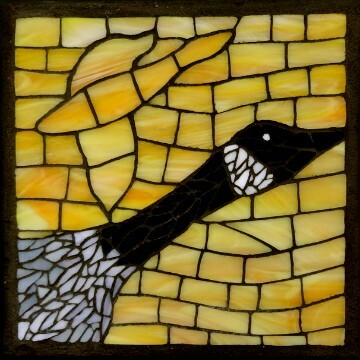 The golden yellow Canada Goose was second in my short series on Canada Geese migrating. From the first light of the morning until dusk, if you live anywhere near a body of water, you'll hear a faithful pair or too many to count passing over, or coming in for a noisy landing on the water. In spring, then again in the autumn when they form large flocks and move as one across the sky, I marvel at their faithful migration habits, as though following an invisible ancestor off their wing-tip. Sold.